Hey NYC families – something very cool coming up! My family has long loved everything Church Street School. impressively wildly talented and dedicated teachers & staff. My boys & I are thoroughly enjoying our latest read aloud: Stanford Wong Flunks Big-Time by Lisa Yee. My wild-about-basketball fourth grader brought this book home to us. At first glance, I wasn’t particularly interested. All I noticed was the picture of the ball on the cover. I thought, oh no, we have to read about sports. Bleuh. Then, my boy pointed out that the main character was Asian.. and the story was about how he’d failed an English class. Huh. I got a little curious. Took a closer look, had a little discussion with the kids & then decided to make this one our next read aloud. I’m so glad we did. The book is about middle school student, Stanford Wong (yes, named after the university). He’s an amazing basketball player but believes he must be “the only stupid Chinese kid in America.” It’s about the terrible summer he has to give up basketball camp to go to summer school instead. It’s about relationships with kids his own age, conflicts between his parents and dealing with the hard reality of having to send a beloved grandparent into an old folks home. The characters in this book feel real. The situations painfully and hilariously believable. My boys are a few years younger than Stanford Wong, but I see them relating to Stanford’s friendships and his first crush on a girl (although they pretend to be grossed out). I think this book is also thought provoking. Some of the discussions inspired by the story include why an elderly person might need to go to a nursing home, why there might be resentment about caring for an aging parent at home and why a kid (or grown up) might feel pressured to lie or misrepresent himself. This is a good book. If you’re looking for something to read with your kids, I recommend this one. Give it a try. Think you’ll like it. But there is one thing in his closet that gets constantly replaced: His work shirts. One small smudge. One worn out elbow. Out the shirt goes. Such a pity. Over the years, I’ve donated far too many of these shirts to charity or to textile recycling. Most of them still looking and feeling essentially brand new. Well no more. From here on out, I’m using these shirts for fabric. This week, I learned the best way to cut apart one of these shirts to salvage and reuse as much fabric as possible (thank you Nasya!). Start by unbuttoning collar, shirt and cuffs. Cut the collar off just below the seam. Next, remove the sleeves. Cut alongside the seam, on the sleeve side. Then cut the thick double layer shoulder piece out. Cut alongside the seam on the single layer part of the shirt. 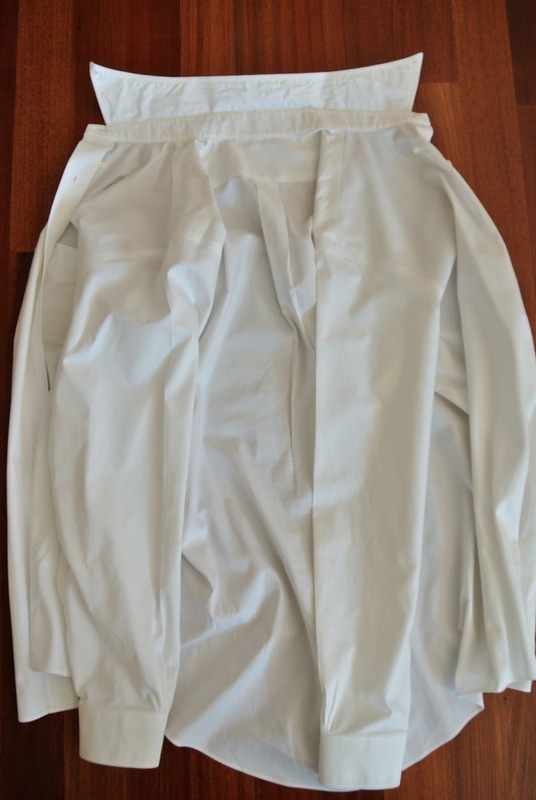 This will release that pleat in the back of the shirt. You will now have one large flat piece of fabric. Leave this. 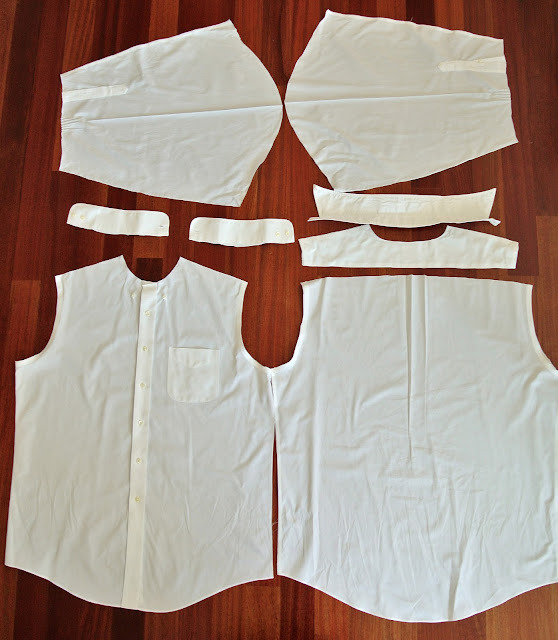 Or cut along side seams to get one large back piece and two separate front pieces (which can be buttoned back together). Trim cuffs off the sleeves. Open sleeves up by cutting along the seam on each sleeve. And there you have it. Nice, flat, reusable pieces of fabric. Really, it’s just “unsewing” all the pieces… but without these instructions from Nasya (my awesome sewing instructor), I would’ve made a mess of reusing the fabric. Now it just needs some steam and a quick pressing and it’ll be ready for cutting. Oh right, and remember, if it’s an upcycling project, it’s nice to preserve some of the details of the original garment. And I am working on a darn cool upcycled something that involves not only a discarded dress shirt but a pair of suit pants and a rejected tie as well. Stay tuned! The more I dabble in stitching, the more I like it. There is something so restful and meditative about working quietly with needle and thread in hand. True, the projects grow slowly. But that doesn’t have to be a bad thing. Embroider a vine and leaf today. Add a flower tomorrow. Enjoy the beauty of each individual addition. Eventually, those small bits will weave together to become something really precious. I believe hand stitching is in my life to stay. I want to learn more. To get myself started, I’ve been referring to the following four books for instruction, tips and inspiration. Stitched Gifts by Jessica Marquez. Embroidered Effects by Jenny Hart. The Gentle Art of Stitching by Jane Brocket. All four books are gorgeously done. I’ve spent hours poring over pictures of projects and perfect stitching. The Handsewn book is strictly about different techniques. The other three show a variety of projects that really let the personalities of the crafter-author’s shine through. It’s also nice to have more than one book to refer to when I’m trying to learn a new stitch. So many stitches and techniques. This will take a lot of time to learn them. But no worries. Because I’m planning to enjoy the process and celebrate every one of my beginner stitches. Stitch by stitch. Project by project. This is going to be an adventure… a quiet one… but an adventure nonetheless. Made myself a needle book out of scraps of felt. I didn’t start with any particular pattern or picture in mind. Just tried out different stitches and “doodled” what felt right… which turned out to be garden themed. I used three pieces of grey wool felt. Two of the pieces measure 8 inches by 6 inches. These served as the outside and inside of the “book cover.” I stitched my bird and flower picture to the outside cover first. I didn’t want the back of the stitching to show. Hence sewing on a second piece to serve as the inside cover. I added a little more stitching to this second piece and sewed the third, smaller sheet to it before sewing “outside’ and “inside” cover pieces together. Giving you a close up of my awful attempts at satin stitching… hoping it will get better with practice… but what I really wanted to show you was this cute little bee. I really like him. Think he’ll be showing up again in my future projects. My springtime, garden motif continued with this ladybug. Added an outline to this inside page. Of course, I had to include my current favorite – Sarah Goldschadt’s little bird. Wouldn’t you agree he belongs in a garden? By the way, what do you think of that stitch I used for the grass? It’s called fern stitch. I think it’s gorgeous and was delighted at how fast and easy it flows (unlike the troublesome satin stitch). I’ll be looking for more ways to use this beautiful stitch again. And there it is. Bright spring colors and garden thoughts translated to a picture with my novice (crooked) stitches. Embroidery needles and pins stored safely inside. Needle book tucked in to my stitching work box. All ready to be pulled out and used for the next hand stitched project.